Dedicated iPhone and Android users alike will get red in the face ticking off reasons why their device of choice is better than the competition's, but it appears team Android's argument just got a little stronger thanks to a recent study that shows its devices are considerably more reliable than the iPhone. 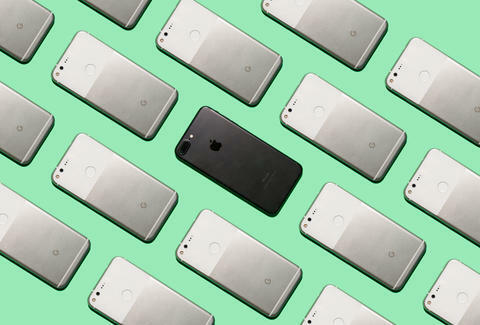 According to the research, which was conducted by Blancco Technology Group and first reported by BGR, newer iPhones experience far more failures than Android devices, and iOS reliability in general has steadily decreased over the last year. To measure this, the surveyors broadly defined a failure as any instance in which a device did not perform a function as intended (for instance, anything from app crashing to battery or touchscreen issues, etc.) and found that the failure rate for iOS devices increased -- quarter over quarter -- for the entirety of 2016, eventually stabilizing in Q4 at 62%. They also found the iPhone 6 to be the most failure-prone iOS device of all, which isn't all that surprisingly considering its rampant touchscreen and battery issues. Android didn't come out totally clean, though. By comparison, its devices also failed a significant amount of the time, but managed to improve quarter by quarter, and were found to be approximately 20% more reliable than iOS devices in Q4 of 2016. Notably, Samsung had the highest failure rate among all Android manufacturers, which isn't a huge shock when you consider its terrible, horrible, no good, very bad year. So for anyone questioning their iPhone faith, this may be yet another reason to consider Google's Pixel the next time you're eligible for an upgrade, even if the iPhone 8 turns out to be as awesome as rumors suggest. Joe McGauley is a senior writer for Thrillist. Follow his rate of failure @jwmcgauley.